Ibrox Noise: Does Andy Murdoch have a future at Rangers? 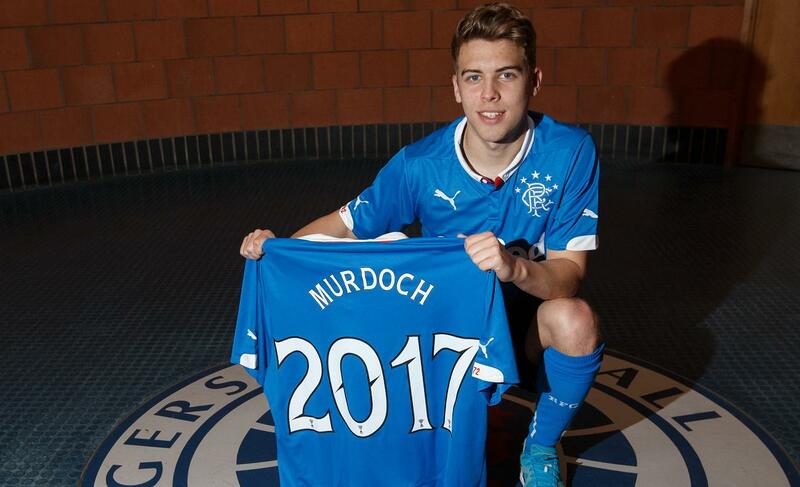 Does Andy Murdoch have a future at Rangers? As covered on here in recent weeks, Andrew Murdoch’s mysterious demotion back the U20s is as puzzling as it is unexpected. After a frankly excellent introduction to senior Rangers team life earlier this year, where the young Murray Park graduate completely showed up the embarrassing Ibrox failure that was Ian Black, the defensive midfielder has been rather strangely cast away from first team affairs while peers Tom Walsh, Ryan Hardie and the now in favour Barrie McKay have enjoyed a spell at the Club’s top table. Meanwhile Murdoch finds himself on Rangers’ youth tours of Northern Ireland and on the reverse of a thorough hiding from Annan Athletic where Canadian Luca Gasparotto had a 90 minutes to forget. As did the rest of the team, suffering as they endured a 5-2 defeat. It had been a great pre-season overall but this result was a stinker, and while Hardie and Sinnamon started the match, they have nevertheless featured with the first team too. Since Mark Warburton started earning his bread at Ibrox, young Murdoch has played no role in the first team, not even earning a place on the bench; defensive midfielder John Eustace appears to have been on trial forever, while Andy Halliday (who can play that slot) has been snapped up, and there have been links connecting Rangers with the gigantic Brentford midfielder Toumani Diagouraga, who also plays in that position. Where does all this leave Murdoch? It is something of a mystery. Warburton has been adamant about giving youth a chance, about using the entire squad; therefore Murdoch’s curious demotion to the younger Academy levels after such an impressive spell in the seniors does fly in the face of that. Equally, it could be spun that Warburton watched the Ibrox outfit in the playoffs and felt Murdoch was not quite ready for action at that level, and indeed as we know Fraser Aird has also undergone some changes with the new manager, being deployed at RB as he now is. In Warburton we trust, and this is no different. He is giving Barrie McKay a serious chance, which no one did from about October 2012, and the youngster is showing some small signs of taking that chance, setting up as he did an assist for Kenny Miller to make it 6 at Easter Road. Whatever he is up to with Murdoch is surely for Andy’s benefit. We just need a little time before we will see the forest beyond the trees. I am not as convinced by Andy Murdoch as some. Although he had a good debut season last year I find it difficult to see why he would play instead of any of Warburton's midfield against Hibs last week. That does not mean that I do not see room for improvement. I do; I am still not a fan of Law and I have my doubts about McKay, but I do not see young Murdoch right now as the answer. I am sure that given the type of coaching that he will receive from the current management team that he will develop and given time he will hopefully be a fixture in teh team. But he still has a lot to learn. Just a pity that he had the misfortune of having McCoist and McDowall delay his development. Lets go with W & W's opinions, if they want better than Andy Murdoch playing in midfield, I am all for that. It could be that he was better than what we had, but what we had were playing rubbish at the time. Have FAITH in the management team and Andy is still training with the first team, so if he continues to improve, he will surely get his chance if there are injuries as the season progresses. Regardless if it's for Andy's benefit or not as long as it's for Rangers benefit I'm happy! WATP! Maybe it's rest... He did play almost every minute under McCall... He will have a season starting later and should be a first pick when/if eustace gets his one year and leaves next summer. I'd like to see Murdoch play a full season with another side in either Scots championship, or England. He needs as many senior games as possible. If things go well for him on loan it would feel like a new signing next year when he comes back. The lad is severely lacking in pace, for a young lad in the modern game, that's not good for him or Rangers.. Looked good in a bad Gers team for me.. Can't see him making the grade. I don't think he fancies young Murdoch if he's giving Eustace all this time to prove himself. Also I've said all along the boy Gasparotto hasn't got it.McCall never gave him a sniff last season when our defence was stinkin,and he won't get one under Warbs either with Macgregor there.He'll be going out on loan again I reckon then released. Hold on a minute we've only played one competitive game! That's not what's being spkoke about though..!! Cheer up! Stick a few quid on Quarabag in the return and that should .ake up for it. IN DELILA WE TRUST ? You're not funny and you don't make any sense. Of course he has a future at Ibrox , like every young player he will have dips in form and maybe he has just started the season slowly .He was tremendous last season , a breath of fresh air and as supporters we should be sticking by him , not moaning he has no pace ??? (hes a midfield player not a winger and he has enough pace for this role ) or trying to offload him to Hibs .People scream out for us to give youth a chance and when one does, this is the kind of guff we have to listen to .Some had the same "doubts " about McLeod who was another terrific youngster .Promote them then rip them to shreds seems to be the way some of our "supporters "think.